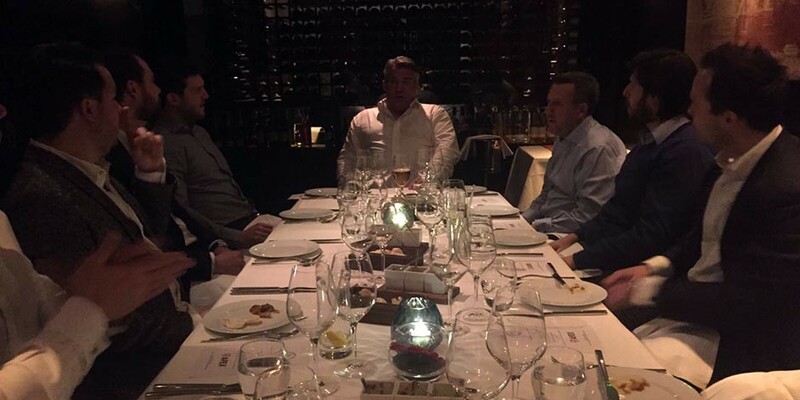 March 17th saw us host a “Sportsmans’” Private Dinner with famed England and Lions international Jason Leonard and partners Afex at one of our long-term favourite spots, Benares on Mayfair’s Berkeley Square. The evening took the guise of a very British Rugby and Curry evening – but with an elite twist – namely dining with a legendary World Cup and Lions winner (an honour that only a handful of people hold) and Michelin starred Indian Cuisine. Guests from across the alternative investment spectrum joined us for the evening in a move away from our normal pure hedge fund focus and this provided a fascinating cross-section of disciplines and outlooks. Sam Marsh of Afex opened the evening over cocktails, welcoming our collected team for the night and Jason of guest of honour. Other guests included representatives from Rampart Capital MFO, Arc and Co and Kairos to name a few. After welcome cocktails we took our seats and each of us took the opportunity to talk a little about our main professional interests and goals, as well as making predictions for the then upcoming crucial Six Nations rugby match with France. To a man, everyone plumped for an English victory which was quite prescient now we know the England team were triumphant! With the evening well and truly underway we gave the floor to Jason who regaled us with some classic rugby stories and insight from his long and illustrious career. Following retirement in 2004 Jason has not taken his foot off the pedal – holding a range of roles in the rugby world (he is RFU President 2016) and the business world alike notably in insurance and construction. Chatham House rules were in affect but learning about the comings and goings of England rugby as it’s managed the transition into the professional era over the past 20 years was more than fascinating. As ever, Benares provided us with an exquisite dining experience, offering an incredible 3 courses with carefully paired wines. It really is a gem in the heart of Mayfair (12 Berkley sq). The evening was rounded off with a notably excellent Tokaji over dessert and plan are already afoot for our next sportsmans’ (and sportswomens’) event. To learn more about Benares Restaurant click here.